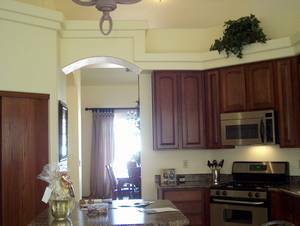 Located in exclusive Rancho Sante Fe Community. 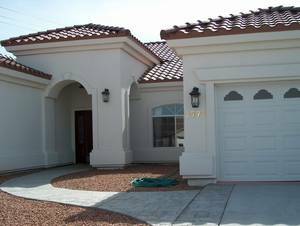 This executive home has 2290 square feet of living space and 3 car garage with 3 Bedrooms and 2.5 baths. This phenomenal home has soaring vaulted ceilings with 10 foot side walls, custom draperies and window coverings, and cherry woodwork and cabinets. 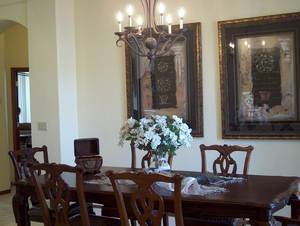 The formal dining room has indirect lighting. The extraordinary kitchen has cabinets with roll out shelves, stainless steel appliances and a full pantry. 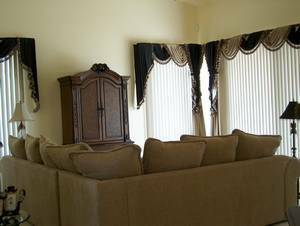 The large living/family room has numerous windows with patio doors that open onto a large patio area. 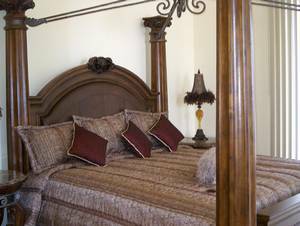 The exclusive master bedroom suite has “his and hers” walk-in closets. 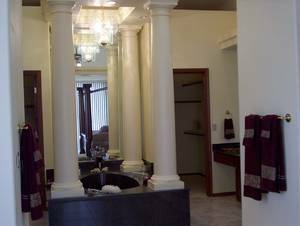 It also has a whirlpool tub surrounded by roman columns and a mirrored back drop, with glass chandelier above. The bath contains a private water closet, oversized walk-in shower, separate vanities with cultured marble tops. 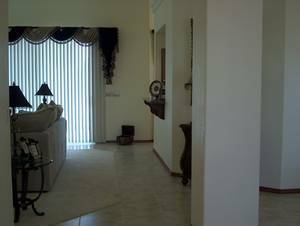 There is luxurious carpet and tile throughout the home. Lastly, there is an oversized laundry room, with built in cabinets. The three car garage has an overly deep third bay for a boat storage area. The home has a central air conditioning system. -Completely and beautifully furnished-One king size bed & Two Twin Beds - Fully equipped kitchen-Three car garage with boat bay-RV parking area, can be locked and secured - All housewares (linens, pot/pans, iron, blender, coffee pot, etc)-stereo system -patio and view of surrounding mountains-Dishwasher, microwave, refrigerator-If you are looking for a great place to vacation with your friends or family members....please reserve ASAP. -One hour drive to visit the London Bridge shopping & tourist area-Boat tours of Lake Havasu and the London Bridge. -35 minute drive to Laughlin casinos and shows-Year-round activities scheduled. - A few minute drive to city golf course. - Fishing, waterskiing on the Colorado River and Lake Meade within a couple hours. - Las Vegas is 100 miles. - Phoenix is 180 miles. - Grand Canyon is 150 miles. - Sedona is 180 miles. - Mexico is a four hour drive. - Movie theaters and Shopping Nearby. The owner will consider a discount for an extended stay. 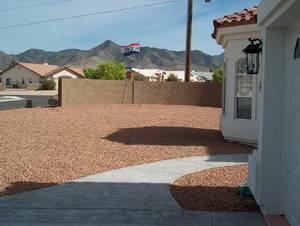 Deposit: $2,000 cashiers check received two weeks prior to rental time. Premises will be inspected upon completion of rental time period and if left in clean/good condition will be refunded to the renter. Other Fees: Telephone is not hooked up, to provide it will become an expense that will be passed on to renter.